Whether you’re a DJ or just someone who enjoy spinning the odd 45 – there’s nothing worse than seeing a big hole on the middle – and not having an adapter to hand. Never fear – you’ll have two to hand if you pick up a pair of these 45 Adapter Cufflinks. 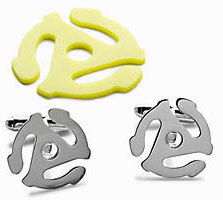 There is one drawback – these are cufflinks – so you’ll look more than a bit foolish if they were to scale. These sterling silver cufflinks actually have a cuff-friendly 0.75-inch diameter, but are still worth considering for the vinyl-lover in your life this Christmas. Available now, they retail for $125 (that’s around £66).